New and innovative HD IP bullet cameras for day and night surveillance are high quality devices equipped with a set of cutting-edge technology and innovative applications enabling fully automated operation of the cameras in the heterogeneous environment observation. With the availability of powerful IR illuminators real to preserve the effectiveness of the monitoring system around the clock. 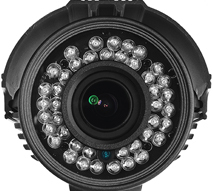 IP cameras bearing the company logo HDiP equipped with powerful transducers megapixel, whose quality allows for smooth recording video in high resolution image. Support for modern standards of capturing video is a guarantee of reliability and functionality of network cameras IP cameras. Powerful IR LED illuminators built-in in cameras allows to&nbsp;;maintain effective surveillance at night without the need for use extra, external sources of illumination. The technology used for the production of infrared illuminators ensure the efficiency of its observations with complete discretion operation of the camera. Light&nbsp;;from infrared range is not&nbsp;;visible for human eye, , so HD IP network cameras with&nbsp;;IR reflectors in&nbsp;;maximum effective level will accomplish the need of precise surveillance for secured places and&nbsp;;objects. and clear image regardless of changing environmental conditions. and significantly affect the effectiveness of the monitoring system. Continuous Image Archiving hour is a task, that successfully implement camera-enabled Active Noise Cancellation. This technology allows for detailed analysis of the recorded image and permanently protect it against the occurrence of the so-called. smearing effect. 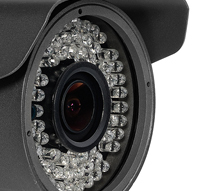 Camera developed by HD IP provide full support for features digital noise reduction. daily. Thanks to special light detectors, that are located on device housing, it is possible&nbsp;;to achieve fully automated system that takes control over infrared illuminator and ensures recording clear and lucid video recordings in&nbsp;;every situation. The effectiveness of this solution does not require the intervention each time the configuration of the installed hardware and provides the user with comfort monitoring network IP cameras. Reliability and rich functionality of intelligent IR LED illuminators makes, that these devices&nbsp;;are today the true determinant of high quality bullet cameras for day & night surveillance.